Wedding anniversary flowers: We provide best wedding flower bouquets, anniversary, wedding anniversary flowers. With same day midnight delivery. Natural Arrangements and Bouquets made of Exotic Products. In Natural & Gold. 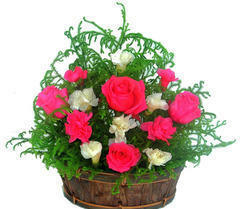 We are engaged in offering an exclusive range of Dried Flower Arrangements in Erode. We make sure the prompt delivery of flowers while retaining their natural look and fragrance. Our florist hold expertise to retain the original properties of flowers in its full bloom. We provide all Floral Arrangements. All Imported Flowers with variants of colors and categories especially designed. Colorful flower arrangements are available to the customer. It may depends upon the customer choice and the occasion , for instance , bridal bouquet , table arrangements, flower basket, and handle bouquet . Bouquet of fragranced flowers tastefully arranged in a PVC box with an E-flute holder. Makes an attractive tabletop decoration and can also be used as a wall hanging.